East of the Cooper is: East Cooper, Mt. Pleasant, Old Village, Sullivan’s Island, Isle of Palms and Daniel Island. West of the Ashley is: West Ashley, James Island, Johns Island and Folly Beach. For detailed maps of these areas, click on the approriate links below. 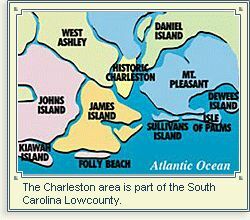 Maps are provide courtesy of Charleston Gateway Magazine. Charleston's Premier Visitors Guide.